The next couple of weeks are going to be hectic as I try to get ready to leave town in less than two weeks (gasp!). I am planning to do some holiday baking, but I don't know how I'm going to fit it all in. Last year I just missed the deadline for Eat Christmas Cookies hosted by Foodblogga (although she was kind enough to link to my post). She's doing it again this year and I really want to participate this time. I'm always bummed when I don't meet an event deadline once I've decided to participate. I'm not doing a whole lot of experimenting in the kitchen right now, although I do have my moments. These Brussels Sprouts with pancetta are one thing I have made recently, roughly based on a recipe from Giada De Laurentiss. If I had cream I probably would have added it at the end, but I didn't. I also normally would have used vegetable or chicken broth in this, but I didn't have any small amounts on hand and didn't feel like opening or unfreezing a quart of broth just for half a cup, so I used what I did have - white wine. It worked just fine, but could have used a little broth to take the edge off the acid, and I wouldn't have needed to add that little pat of butter at the end. And I am totally in love with pancetta. There are some things that demand the smoked goodness of bacon (navy bean and bacon soup, BLT sandwiches, breakfast), but I am developing a taste for the more subtle flavor of the unsmoked pig. And I can buy as much or as little as I want at the deli counter. Heat skillet over medium heat and add pancetta. Cook until pancetta has darkened significantly and most of the fat has been rendered. Remove from skillet and place on a paper-towel lined plate. 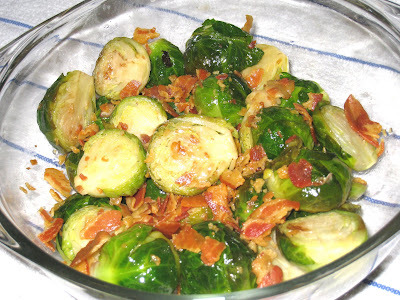 Remove the sprouts to a serving dish and crumble pancetta over them. Serve immediately.